Do you need information about commercial sites, technology and business parks, commercial properties, infrastructure, the job market and/or living accommodation in the Schwarzwald-Baar-Heuberg region? Send your query to us at info@wifoeg-sbh.de. An industrial estate is being built on the A81 in Sulz am Neckar. The development and marketing of this attractive commercial area is one of Wirtschaftsförderung SBH’s key tasks. 40 ha. with extendable option are provided for a company from outside the region. Attractive location in Central Black Forest at midpoint of Stuttgart-Zürich innovation axis. What can our economic development company do for you? We can help you implement your investment plans as swiftly and smoothly as possible. We provide you with a competent advisor who will support you free of charge in all issues relating to your investment and bring you into contact with suitable business partners as required. You will have access to an application-orientated technological platform offering technology transfer geared to the region’s profile, as well as short paths to suppliers and customers. Centrally and conveniently positioned on a road and rail intersection in Southern Baden-Württemberg, the Schwarzwald-Baar-Heuberg region is a strong business location with an impressively dynamic economy, a high standard of living and quality leisure opportunities. The region’s economy boasts a well-balanced combination of business sectors. Medical technology, microsystems technology, automotive suppliers, component manufacturers, mechanical and precision engineering are the pillars of its manufacturing industry. 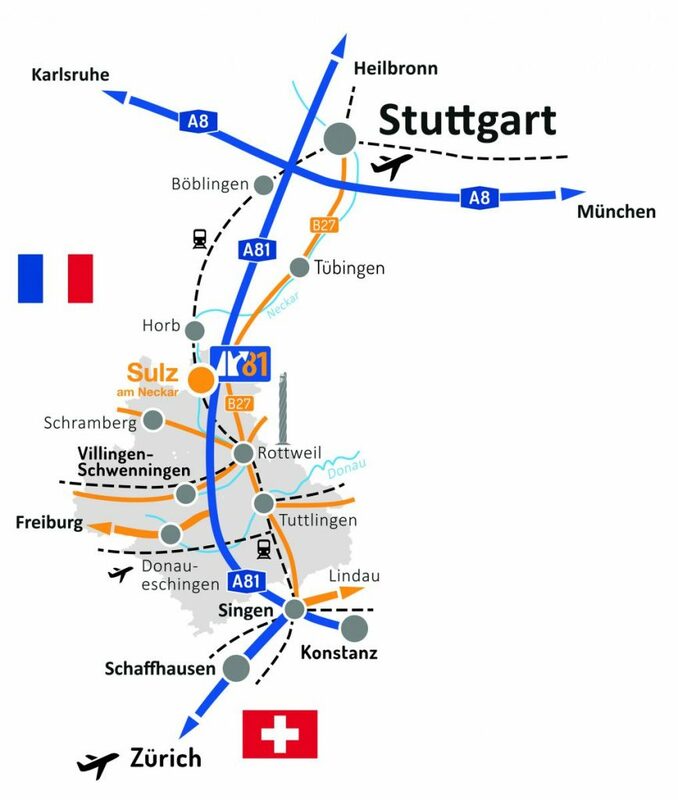 One of the most important transport corridors in Europe, the A81 Stuttgart-Singen motorway, runs through the region and plays a central role in connecting Germany to Switzerland and Italy. Other international connections are provided by the highly developed federal highways. In particular, the B31, B311, B33 and B462 east/west main roads connect the region via the Black Forest with the Alsace region in France, with Stuttgart and with the area around Lake Constance. The B14 and B27 highways form a further important north/south transport axis. The rail system is ideally integrated via the Stuttgart-Zürich “Innovation Axis”, the Gäu Railway and the Black Forest Railway. These two transport systems create a direct link to the major national and international north/south rail networks. Within the region, the “Circle Line” provides optimal local connections. The region has three transportation airfields – Donaueschingen, Villingen-Schwenningen and Neuhausen ob Eck – and international airports at Stuttgart and Zürich are both within easy reach in just one hour. The region is a “congestion-free zone” with unhindered circulation for goods traffic and local logistical services.